Resin Cars Works is pleased to announce the release of our seventh kit; GATX Type 30 Class 103/203 tank cars! These are Special Edition releases with production limited to a few dozen kits. This kit is different from previously released Resin Car Works GATX tank cars as it lacks all the small typical parts like brake components, grabs and wire. Please note there are rumors of a plastic version of this car is in the works. We have no knowledge as to when the plastic product will be released. We’ve been messing with this GATX tank car kit for years and have accumulated enough casting sets for this Special Edition. Two paint and lettering schemes are available. The kit consists of two-piece resin tank casting, one piece frame casting, and resin detail sheet. 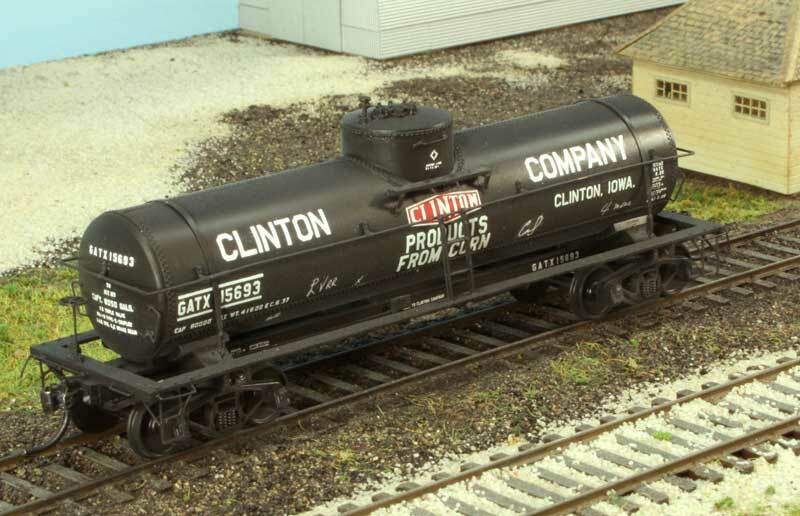 Also included are decals, Precision Scale Company brass handrail stanchions, pipe “T” and air hoses, Elgin Car Works etched tank bands and GATX tank car stirrups, and Plano Models etched tank car placard boards. The kit lacks all the small typical parts like brake components, grabs and wire. These Special Edition releases are limited to a few dozen kits. These kits are $50 each, plus shipping and Illinois sales tax if you live in the state. Check the Kits page on the Resin Car Works website for prototype photos, model-specific details, and an order form. Please, please NOT “stirrups” they are Sill Steps!